Submitted by lmcshane on Tue, 04/22/2008 - 19:16. 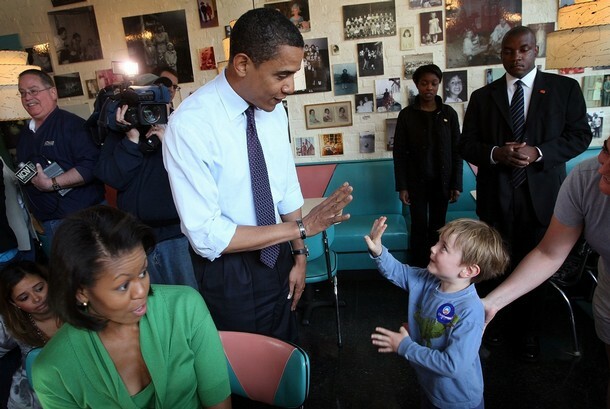 Three year old Owen clinches Pittsburgh as the site for the 2009 G-20 summit with a high five. Submitted by lmcshane on Wed, 04/23/2008 - 14:26. Okay, now everyone knows that I know some VERY important people! This is my nephew and, believe me, he knows how to network! And today the AP photo by Jae C. Hong was picked up by the LATimes. So, what's the cool thing about the Romanian press site? It catalogues/indexes posted information and credits the photographer. How cool is that? *NOTE: the Secret Service guy is keeping a close eye on Owen...I don't blame him! (He has been known to projectile vomit :) The photo is from Getty Images. Submitted by lmcshane on Sat, 04/26/2008 - 11:26. Why did May-Day become a distress signal and why don't we celebrate May Day in America? May ponderings. Growing up in the turbulent, polluted seventies, borne of family that fled turmoil in Europe, my consciousness is filtered through my childhood memories of the murders at Kent State, pot-smoking babysitters, Watergate, DDT, napalm, cigarettes, smog, automobiles and the often hateful murmurrings of my relatives from Eastern Europe. Gypsies, Jews, Slavs, Magyars, Avars, Turks, Franks, Celts, Anglo-Saxons...it's all one bloody swirl to me. So, for me, it is fitting that the Kacalieff Lecture Series and Cleveland Institute of Art premieres films of Romania starting in May. There is nothing like revisiting the past, to vision for the future. Submitted by lmcshane on Thu, 05/01/2008 - 08:59. This month's AAA Motorist, reports that consumers are "understandably upset" about gas prices. Well, Barack Obama notes that we are upset, too, but he gives an honest answer that could have gone further, but we refuse to look at ourselves. We all need to change. Submitted by Norm Roulet on Thu, 05/01/2008 - 10:25. I have been astounded to see Clinton and McCain propose a gas tax holiday as solutions to the gas reality, which is that gas will no longer be affordable for anyone but the rich. Their proposal has been well documented as fiscal lunacy. Obama is opposed to such stupidity. So now we see which candidates are literally stupid, versus smart. That should make voting much easier for everyone who cares about having a smart President. Unfortunately, Bush has proven Americans don't care about having a smart president... so we will likely remain a very stupid country for the next four years. Will Americans and the world survive that? Submitted by lmcshane on Sat, 05/17/2008 - 11:01. Mansfield B. Frazier says it all with Hit me with your best shot! Submitted by lmcshane on Sun, 08/23/2009 - 10:50.